About the hotel barge "Renaissance"
Arguably the finest combination of regions one could barge through! From the mighty River Loire to France's oldest canal, the Canal de Briare, a waterway steeped in history, past beautiful scenery and small country villages. Renaissance accommodates up to 8 guests in ultimate luxury. Her interior has been extensively refitted and includes a beautifully appointed and spacious lounge area with comfortable seating. Renaissance's other impressive features include a forward deck with a roof extension for alfresco dining and an on-deck heated spa pool. Guests are met at the Hotel Westminster in Paris and transferred by private chauffeured minibus to the spacious Renaissance, where a Champagne Welcome with canapés awaits. Time to explore the pretty village of Montargis by foot or bicycle before dinner on board. Morning cruise through the Loire countryside, with great towpath walking and cycling opportunities, to Montbouy. After lunch we visit Chateau de Fontainebleau, a national museum and UNESCO World Heritage Site. To walk through this magnificent palace is to walk through the history of France. It is the only royal and imperial chateau to have been continuously inhabited for seven centuries and every French royal family added its own architectural style and features when in residence. This morning we visit Chateau de la Bussiere, known as the "fishermen's castle"... enjoy the ornamental and vegetable gardens, typical to France. The castle orginally belonged to Georges de la Tremouille, who infuriated Joan of Arc by encouraging the Dauphin to devote himself to idle hunting in the forests around Sully. After her failure to liberate Paris in 1430, de la Tremouille imprisoned Joan in the castle. In the 18th century, voltaire, exciled from Paris, also spent time at the chateau. Following lunch back on board, we enjoy an afternoon cruise to our mooring in the pretty village of Rogny-les-Sept-Ecluses, near its 350-year-old 7-clock flight, which is well worth visiting on foot. After a leisurely breakfast of fresh croissants, baguettes and assorted pastries, we visit Gien, home of the Faience pottery, renowned for its beautifully decorated and vibrant dinnerware, and also explore the bustling market. 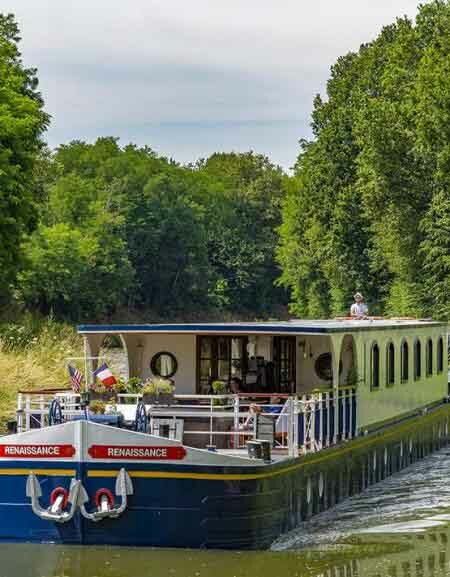 After lunch, we enjoy an afternoon cruise to La Gazonne, a beautiful mooring surrounded by lakes and ponds which provide water for the workings of the Canal de Briare. Dinner ashore at the Michelin-starred Auberge des Templieres in Les Bezards. A morning cruise to our mooring at the little town of Briare, site of Gustave Eiffels magical aqueduct across the River Loire, again with excellent walking and cycling opportunities. We preview Fridays crossing of this amazing 10,000 ton, 662 meter Pont Canal which was completed in September 1896. This afternoon, it's time for a private wine tasting in a renowned winery in the Sancerre region, such as the Domaine Henri Bourgeois in Chavignol. Wine has been produced in this hilltop medieval village since Roman times. We return to Renaissance in the late afternoon, ready for dinner on board. It's market day! Time to savour the essence of french life...wander around vegetable and fruit stalles, seafood, cheese and French fashion stalls in the market in Briare. Can you barter as well as the locals? We then take a short cruise across the Briare aqueduct from where you can take some excellent photos, before lunch on board. Our final excursion takes us to Château de Ratilly, with it's rather spectacular selection of turrets. Construction began on the château itself in 1270. We return to Renaissance to look back over our week aboard during the Captains Farewell Dinner. After breakfast, guests are transferred by private chauffeured minibus to the Hotel Westminster in Paris.